I'm sure they will release it when it's ready, but there were no safety issues in that release. I will probably move these posts about the 200 to the 200 section probably to this thread http://evolvapor.forumchitchat.com/post/dna75-escribe-8097271, not censoring anyone it is just a bit too off topic. Is there anything major the DNA75 can do the DNA200 can't? That's the main thing I want to know, because I basically religiously run NiFe-30 and SS430 fused claptons in high wattage TC and I'd hate to miss out for the lack of wattage. Not major, it is very similar to the 200 to operate, but I doubt it would suit you at those wattages. 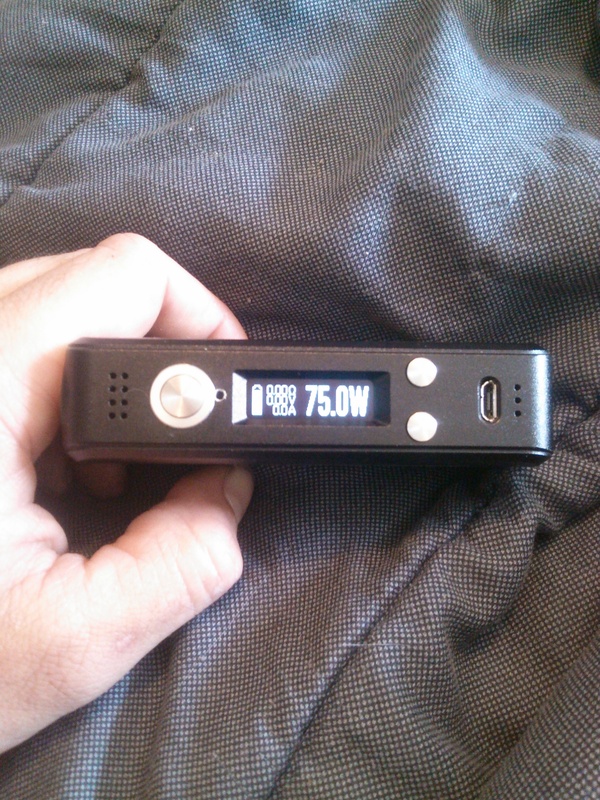 75 W is a lot from a single cell, it dies a great job at getting the best from the battery, run time is good IMO. But if you are running 75 W preheat like I do at the lower end of the battery voltage that will throttle back because the sag from an 18650 and the run of the mill keystone battery sled we have in the beta units. LiPos would will perform better in that respect and better battery contacts would also help. I am just changing the battery now, it's a 25R and I got a good vape all the way down to 3.25 V, longer drags toward the end as the preheat was not as powerful. Obviously if you were using in power mode it would totally depend on when you battery sage hit the threshold under load, that's just the physics of batteries. They will continue to optimise this so don't take what I wrote as set in stone. My main wonder with the DNA75 is the fact it's went from the high efficiency of a buck-only system rated at 97% to a boost-buck system. So has the DNA75 lost ANY efficiency over the 200 due to this change? I know Evolv is, very capable. I just know that in general, both through career experience and use experience that buck-only systems tend to have a much higher efficiency. I'm not saying it's impossible with a buck/boost DC-DC converter, but, it is a thought. I know with a single cell, even 75-80W can be pushing it. Batteries do wonderful things like sag and then there's drop on the mod, and since the HCigar DNA75 is seemingly meant to be used with high internal resistance 26650's I figured the battery sag off of a single cell 26650 setup would definitely limit the wattage at around 75-80W on a buck/boost system if it was still expected to be efficient and affordable. I have an intimate understanding of electronics thanks to my education and career as an engineer, but when it comes to software, programming, the etc's of such, I'm up to speed but I'm not way up there like the people who are programming these boards are. So I'm not entirely familiar with how one would go about programming a board like this, I could easily imagine how the board was made in relation to its idea of use on the electronics end, but past that my knowledge is pretty limited. This is why I was asking. My worry with a single cell mod is, with a cutoff of, 2.9V I assume, maybe 3V, that once you got down to the 3.4V range if you were at a higher setting, like 60W plus, it'll sag past the cutoff and create issues. I'm not a big fan of single battery mods, both due to a lack of power capability and how hard single cells get strained in devices. I'm really glad to see Evolv didn't release a single battery 100W device like some companies are doing, you can always count on Evolv to do the right thing. As you say there is no way for it to match the 97% efficiency of the 200 step down conversion the spec sheet has the efficiency at 85%, but I get good run time from it considering. Not sure what the cut off is off hand, maybe 2.5, 2.6 V under load. There is no such thing as a free lunch and 18650 only have so much usable power, but they are not the only battery option although they will probably be the most popular. To be honest I prefer 18650's due to the generally lower internal resistance they have, 26650's seem to be re-wrapped to hell, there's not many genuine 26650 brands out there, so you end up with all these '50A' 26650's that are 20-25A batteries that have a considerable IR. 85%, damn, that's quite a hit. I well expected it to be lower, buck on a three cell with Evolv's known precision is going to give results at the higher end of the spectrum, but 85% is quite a hit in efficiency. That's still pretty good though. The cut-off voltage having a lower charge under load is wonderful to hear about, especially since it's a single cell device. Most mods keep the VCoff at the 18650 general cutoff of 2.9-3.1V. I was thinking LiPo and dual 18650 for the more power hungry. I think that is just the min efficiency and it is probably a lot higher in many parts of the range, it certainly doesn't feel like a battery eater in daily use. BTW the soft cut-off is set to 2.75 V in EScribe, I was just guestimating from dm plot before. It would be cool to see parallel setups or 1S setups in the feature for sure, that's probably the route I'll take as I now have legitimate quality soldering tools because I started making PWM 3S mods. I would add that the cut off is more than just a voltage level switch, there are algorithms under there with the weak and check battery warnings are tied into that as well. The only real benefit to using a switch is, cheaping out really. That's good to hear. New version of Escribe75 is available. my dead VT200 has a new life now. put the 75 board in with some modifications. rewired the 3s hcigar lipo for 3p. drilled a not so perfect hole for the LED. is this an ideal enclosure......no, but i have some 18650 75's on the way so this was just kind of a "why not" project. not hard, as long you're VERY careful when separating the pack into individual cells, being careful not to hard short any of the cells. the positive and negative battery tabs will most likely be aluminum and if you're soldering you need a flux that can be used with soldering to aluminum. the 3s hcigar lipo pack i rewired for parallel came out to 11.14 watt hours when i ran battery analyzer.